If yesterdays weather in Cape Town was a hint of what’s to come, Winter is on the way. This means raincoats, closed shoes, jeans and jerseys (a big step for a shorts and slops guy!). So it’s only fitting that I start gearing up for some great winter meals like this Toad in the hole with red onion gravy. This meal is a ‘proper’ English classic, so I’m told, and truth be told, the first time I’ve ever eaten let alone attempted to make it. Preheat your oven to 200c/400f placing an ovenproof baking dish inside to warm up. Crack your eggs into a mixing bowl and add a pinch of salt, whisk adding in the flour, reserving 1/2 tbs and whisk till smooth. Once you’ve used up the flour add in the milk bit-by-bit, whisking it each time before adding more. You want to add in 190ml in total, when smooth and combined put to one side. Remove your baking dish from the oven and carefully pour in 1tbs of vegetable oil, add in the sausages and move them around a bit so they are well coated. Return the tray to the oven and roast them for 20-25mins, till golden brown. Peel your potatoes, cutting them into halves so they are fairly evenly sized, place in saucepan, cover with water, adding a pinch of salt and place on a high heat. Once they are boiling reduce to a medium heat and simmer for 10 minutes, or until cooked through. Peel and finely slice your onion, add to a medium saucepan with the thyme and lug of olive oil, cover with a lid and on a medium heat, cook them for 20mins. Keep an eye on your potatoes, when they are cooked, drain them and return to the warm pan, add in the rest of the milk and put it back on a medium heat until the milk is boiling, then turn the heat off, add a pinch of salt and mash until smooth, keeping the lid to keep it warm. Open the oven and add the rosemary sprigs, pouring over your reserved batter, slide the dish back into the oven, cooking for a further 30mins until golden brown. Turn the heat up under the onions, take the lid off to let them brown for a few minutes, add your reserved flour, stir well then add the food stock and vinegar. Bring it to the boil and then reduce to a low heat for 10mins. Bring your kettle to the boil, adding some water to a small saucepan, add the peas and a pinch of salt. Place on a high heat and cook for 3mins until al dente. Drain them and return them to the hot pan, season with salt & pepper with a lug of olive oil. Pick the thyme out of the gravy, checking the consistency, if looking good turn the heat off. 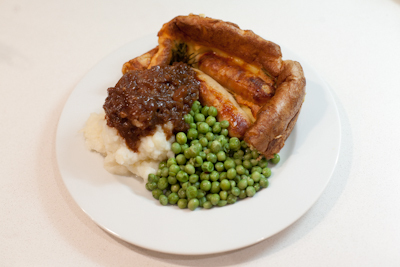 Get the toad in the hole out of the oven and serve with your pan of creamy mash, peas and gravy. This meal is bound to put a smile on your face and comfort food at its best, just recounting the recipe is making me salivate. This is a firm favourite in our house, and I can tell you it looks perfect. It is definitely a British classic. Yorkshire puddings are a hard dish to master, very temperamental, so I’d say you did a grand job for your first try! Hi Nic, thanks for the kudos and compliments, from the pics I’ve seen i got pretty close. Either way it tasted great and will be making it again as winter starts to set it. Marisa, it isn’t all that common in this neck of the woods though, pretty sure most South African’s haven’t had it. Looks like I’m in good company then – have also never had toad in the hole! Shocking, right? I’ve seen a few recipes from this (mainly from the British contingent) but have never been confident to actually make it – the potential consistency of the batter always puts me off. Might actually give it a try now…if all else fails at least the onion gravy should be good! just cooked the toad in the hole, straight from the recipe. it turned out awesome. Hi Jimmy, yip, made it several times, bar one experience that was total user error they’ve come out tops!